If the highways of Hitchin were in a claggy state in the seventeenth century, the country lanes around Preston were mud-bound and impenetrable in wintertime. The problem was created by Preston topography – the chalky subsoil prevented free drainage and the clay top soil was easily churned into a quagmire. In the early 1700s, villagers living at the end of impassable lanes complained that they were ‘weary of this deep dertie country life’ (sic). Although the lanes were called ‘thoroughfares’, few were able to ‘fare’ through as winter devoured ‘whatsoever we were able to lay on in the summer’. A petition concerning the by-ways around Hitchin raised in 1726 read: ‘so bad and ruinous are they and so narrow that the waggoners cannot in some parts go on the outside of the cart ruts and several dismal accidents have lately happened’. Mr Hale of Kings Walden faced with the obstacle course which was his run via Preston to Hitchin invented a one-wheel cart which slotted between the ruts. When Benedict Ithell of Temple Dinsley ordered a new carriage, its makers asked for the width of the ruts in his area so that his carriage’s wheels could be set precisely that distance apart. The surveyors of highways were constantly ordering repairs - ‘pecking in the ruts”. Captain Hinde of Preston Castle was moved to write to a surveyor in 1767, ‘I must not only desire but insist that you will directly give orders that the roads leading to Hitchin may be made passable – which at present they are not. I was in the most imminent danger of being overturned the last time I went to Hitchin, which prevents my going ever to Church.’ Another time he referred to the ‘tortuous, pitch-dark and perilous tracks to Preston’ which made it impossible to venture out after nightfall (unless one was a highwayman) and added, ‘your ancestors contrived our narrow lanes in the days of wheelbarrows before those great engines, carts, were invented’. Now, the roads around Preston were much improved. 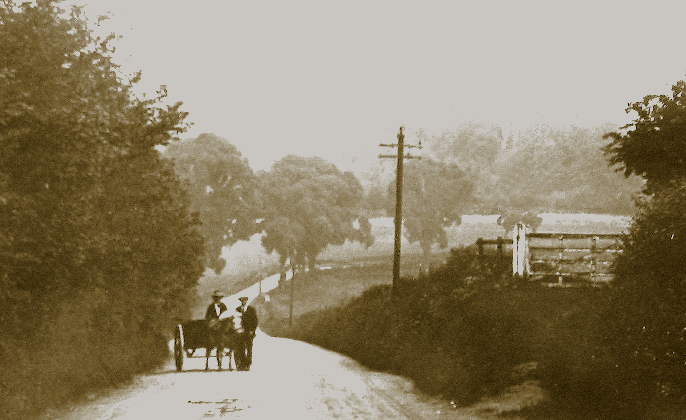 As the nineteenth century brought more improvements, not only the squires travelled in carriages, but several of the local tradesmen used a horse and cart. The improved state of the roads around Preston can be assessed from the circumstances that led to the horrific accident which claimed Edward Foreman’s life at the bottom of Preston Hill in 1864. Although this occurred in early January and on a cold, frosty night, the road surface was sufficiently smooth to allow for his cart to be travelling so fast that it failed to negotiate the sharp right-handed bend at the bottom. Yet there were still the occasional problems maintaining local lanes. In December 1892, this news story appeared: ‘John Dew, farmer of Preston (Castle Farm) was summoned for neglecting to repair a certain highway leading from Charlton to Offley in the parish of Preston. Mr W. O. Times, clerk to the Hitchin Local Board, appeared for that authority. The case was brought in order that the highway (which forms the boundary of two highway districts) be divided transversely. The Bench decided that Hitchin should take the part from Wellhead Farm to the west corner of Offley Holes turning, the remainder being repaired by the parish of Preston’.